This is about your Banksia Park Puppy and where your puppy came from. 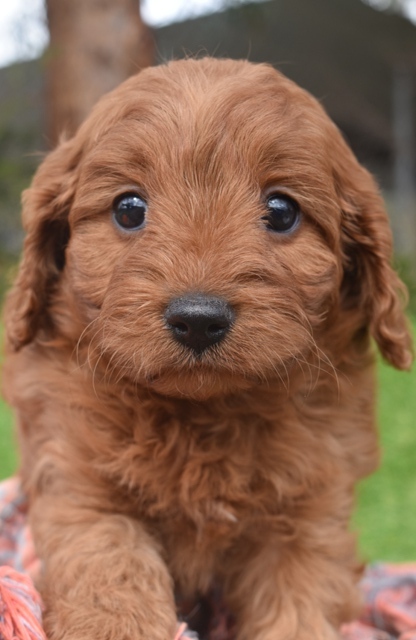 We hope you enjoy it and we wish you a wonderful life with your Banksia Park Puppy. We are extremely proud of our property. We work hard to provide a social, happy environment for our dogs and puppies where all of their emotional, mental and physical needs are met. We have puppy playgrounds for our younger dogs in their live-in yards. These dogs are within their critical socialisation period and get lots of attention. Our older dogs also live in big yards with lots of room to run and chase. At Banksia Park Puppies we have staff who just sit and play, pat, and lead the dogs and puppies so that they get daily love and attention. Our dogs love our puppy playgrounds. Our focus on socialisation programs ensures that our dogs are successfully rehomed after 5 litters. This is one of our agility yards. It has a pool, lots of obstacles, and a big ball pit. This is our second agility yard. Our dogs play here in groups of up to 6. They love having their exercise, a swim on warm days, and playing with their furry friends. We focus intensively on socialisation in the first 12 months of a puppy’s life and particularly over the first 4 months where their learning is of the utmost importance. For the first 4 months, our future mums and dads come here every day. They encounter things like tiles, carpet, TVs, and even noises like smoke alarms! This helps them develop into confident adults. This is where your puppy was born. It has heating and cooling and is specially designed to ensure mum and puppies are safe and healthy in this special time. Mum gives birth on soft hay in a cardboard box. They have specialised care here and mums have access to outside areas day and night, every day. These rooms in the nursery are for the bigger and older puppies. The rooms are bigger so they have more room to run and grow. The mums here have exercise twice a day for at least two hours each session. This allows mum to exercise, play with the other mums, go to the toilet, and have some food away from their puppies. This is your puppy with its siblings at around two weeks of age They’re usually sleeping a lot at this age, especially while mum is out having some exercise. Your puppy is now 6 weeks old.